Whether you’re dressing for a job interview, a party, a day at the office, a night out, or a lazy Saturday at home, your choice of attire says something about you. Like it or not, your clothing sends a message–and that message isn’t always the one you want. Like icebergs lurking in the frigid waters of the North Atlantic, here are ten common fashion blunders that can sink your attempts at debonair sophistication. But like those icebergs, they’re all easily avoidable. All it takes is a little knowledge, common sense and preparation. First step on the road to sartorial proficiency is to make sure your jacket and pants actually fit, i.e. aren’t too loose or too tight, lest you evoke the look of a high schooler wearing his dad’s suit to the prom. Unless you’re able to have a suit custom-made, buy off the rack and have your tailor make adjustments. Make sure to purchase a suit with as close to a proper fit as possible. Tailors aren’t wizards. Sleeves and pant legs that are the wrong length will make you appear either sloppy or like you’ve outgrown your clothes without bothering to replace them, neither of which should be your objective, look-wise. 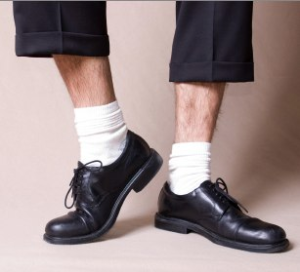 Trousers should have a slight break in the front without reaching the ground or bunching excessively (your socks should be hidden when you stand up straight). Sleeves should reach approximately to your wrist bone; one-fourth to one-half inch of your shirt cuff should be visible past the end of your coat sleeve. The benefits of pleats: they look more formal, they can be more comfortable when you sit, and, because they’re worn higher on the waist, they can have a slimming effect. The vertical lines can also make shorter men appear taller. Conversely, when worn incorrectly, they tend to bunch up with excess fabric around the crotch, particularly on skinnier men. If you’re on the thin side, you should stick to flat-fronts. You’re a put-together professional man. You’ve got your suit, you’ve got a great tie collection. Everything matches. Everything fits perfectly. But wait–what do you use to carry things to work? Of course, you think–you used a backpack every day at school until you graduated from college, why not stick with what works? Here’s why: nothing undermines a great suit like making yourself look like a schoolboy. Invest in a quality briefcase or messenger bag to keep your appearance professional. Socks provide a great opportunity to make a fashion statement that’s simultaneously bold and subtle, but, particularly when you aren’t swinging for the fences, there are some rules. Match socks to your pants, not your shoes; if your pants are lighter than your shoes, your socks should be darker than your pants. Also, we shouldn’t have to say this, but in the name of everything holy, don’t wear white athletic socks with dress clothes of any kind. Speaking of socks, this is a distressingly common mistake in more casual settings. Unless you’re from ancient Rome (in which case, welcome, time traveler!) or employed as a fashion model, you have no business attempting to pull this look off. Generally associated with clueless tourists and beachgoers, it’s a faux pas so reviled, it has its own Wikipedia page. Avoid, avoid, avoid. You wouldn’t want to disappoint the King of England, would you? Of course you wouldn’t. Always leave your bottom button undone. On a two-button coat, button only the top button. When wearing a three-button coat, fasten the middle button; depending on the cut, you might button the top one as well. Thus: the “sometimes-always-never” edict. The knot you use is a matter of personal style. The length of your necktie, generally speaking, is not. 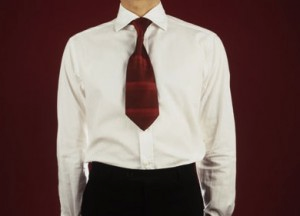 A tie that reaches to somewhere on a man’s belt buckle radiates an aura of fashionable confidence; a tie that’s longer or shorter suggests carelessness and inattention to detail. This one’s simple, but when you do it wrong, it stands out. Match your belt to your shoes to avoid drawing disapproving stares. You don’t just need the right shoes, you need them to look good, too. Just like a wrinkled suit, scuffed, smudged, dirty or otherwise imperfect footwear can undermine your entire appearance. The good news: a little forethought and elbow grease (or shoe polish) can easily fix the problem. It might seem like there are a million rules to follow. But the truth is, they aren’t difficult rules. It comes down to attention to detail. Buy dress shirts, suits, and pants that fit you. Maintain them properly. Beyond that? Once you know what to do and have laid the groundwork, it’s easy to keep yourself looking sharp in every situation. Thank you for your request, Thomas! We will be happy to have a copy of our current catalog mailed out for you. Simply call us at 1-800-247-1417 or email us at custserv@paulfredrick.com with your complete address. Any of our representatives will be happy to assist you with your request. be actually something that I think I wojld never understand.